Google’s parent company, Alphabet has struck a $1.1bn (£822m) deal with Taiwan's HTC to expand its smartphone business. Shares in HTC were suspended in Taiwan on Thursday. "It's still early days for Google's hardware business," the firm's senior vice-president of hardware Rick Osterloh said in a blog post on Google's website. Under the deal, Google will acquire a team of people who develop Pixel smartphones for the US company and receive a non-exclusive license for HTC's intellectual property. "These future fellow Googlers are amazing folks we've already been working with closely on the Pixel smartphone line," Mr Osterloh said. According to HTC half their smartphone research and development team - about 2,000 people - will go to Google. HTC manufactures Google's smartphones, the Pixel and Pixel XL. The company will release updated version of the devices next month. Yesterday, within just a few hours, most of Apple's millions upon millions of users were using the latest mobile operating system, having tapped on the prompt to download iOS 11. Contrast that experience on Android, where the company's impressive and innovative updates are greatly hampered as it can take months, sometimes years, for those features to filter to users. In some respects, this $1.1bn deal is like a good friend lending their pal a few quid to tide them over for a while. HTC needs Google's money to keep going. And Google needs HTC's expertise and manufacturing capability to remain competitive with its mobile devices. The deal marks Google's second major foray into smartphone manufacturing. In 2011 Alphabet, then named Google, bought Motorola's Mobility for $12.5bn, only to sell it on three years later. 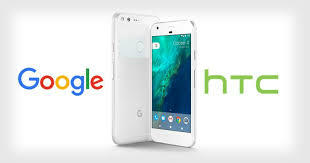 Geoff Blaber from CCS Insight said while the HTC deal might "raise eyebrows" given Google's history with Motorola, it will give the firm valuable design and engineering resources. "The far bigger risk for Google would be to stand by and do nothing as hardware becomes an all-important means to an end for its core business," Mr Blaber said. "It's a much needed investment as HTC struggles to maintain its smartphone business and grow its early start in virtual reality," he added.